"Advance Australia Fair" is the national anthem of Australia. Created by the Scottish-born composer Peter Dodds McCormick, the song was first performed in 1878 and sung in Australia as a patriotic song. It replaced "God Save the Queen" as the official national anthem in 1984, following a plebiscite to choose the national song in 1977. Other songs and marches have been influenced by "Advance Australia Fair", such as the Australian vice-regal salute. Peter Dodds McCormick, the composer of "Advance Australia Fair"
"Advance Australia Fair" was composed in the late 19th century by Peter Dodds McCormick under the pen-name "Amicus" (which means "friend" in Latin). It was first performed by Andrew Fairfax at a function of the Highland Society of New South Wales in Sydney on 30 November 1878. The song quickly gained popularity and an amended version was sung by a choir of around 10,000 at the inauguration of the Commonwealth of Australia on 1 January 1901. In 1907 the Australian Government awarded McCormick £100 for his composition. One night I attended a great concert in the Exhibition Building, when all the National Anthems of the world were to be sung by a large choir with band accompaniment. This was very nicely done, but I felt very aggravated that there was not one note for Australia. On the way home in a bus, I concocted the first verse of my song & when I got home I set it to music. I first wrote it in the Tonic Sol-fa notation, then transcribed it into the Old Notation, & I tried it over on an instrument next morning, & found it correct. Strange to say there has not been a note of it altered since. Some alteration has been made in the wording, but the sense is the same. It seemed to me to be like an inspiration, & I wrote the words & music with the greatest ease. The earliest known sound recording of "Advance Australia Fair" appears in The Landing of the Australian Troops in Egypt (circa 1916), a short commercial recording dramatising the arrival of Australian troops in Egypt en route to Gallipoli. Before its adoption as Australia's national anthem, "Advance Australia Fair" had considerable use elsewhere. For example, Australia's national broadcaster, the Australian Broadcasting Commission, used it to announce its news bulletins until 1952. It was also frequently played at the start or end of official functions. Towards the end of World War II it was one of three songs played in certain picture theatres, along with "God Save the King" and the US national anthem. Until 1974 "God Save the Queen" was Australia's national anthem. In 1973 the Whitlam government decided that the country needed an anthem that could represent Australia with "distinction" and started a competition to find one. This decision by Whitlam was driven by the desire to forge a new nationalism separate from Great Britain. In 1973, Gough Whitlam dedicated an entire Australia Day speech to the search for a new anthem saying that it will be a "symbolic expression of our national pride and dignity". The Australia Council for the Arts organised the contest, which was dubbed the "Australian National Anthem Quest". The contest was held in two stages, the first seeking lyrics and the second music, each having an A$5,000 prize for the winning entry. On the recommendation of the Council for the Arts, none of the new entries were felt worthy enough, so the contest ended with the suggestions for "Advance Australia Fair", "Waltzing Matilda" and "The Song of Australia". In 1974 the Whitlam government then performed a nationwide opinion survey to determine the song to be sung on occasions of national significance. Conducted through the Australian Bureau of Statistics, it polled 60,000 people nationally. "Advance Australia Fair" was chosen and was enshrined as the national song, to be used on all occasions excepting those of a specifically regal nature. A spokesman for the Prime Minister Gough Whitlam stated that the Government regarded the tune primarily as the national anthem. During the 1975 election campaign following the dismissal of Whitlam by Sir John Kerr, it was proposed by David Combe that the song be played at the start of the Labor Party's official campaign launch on 24 November 1975 at Festival Hall, Melbourne. Whitlam's speechwriter Graham Freudenberg rejected this idea, on two grounds, one of which was that the status of the anthem was still tentative. In January 1976 the Fraser government reinstated "God Save the Queen" for royal, vice-regal, defence and loyal toast occasions as well as making plans to conduct a national poll to find a song for use on ceremonial occasions when it was desired to mark a separate Australian identity. This was conducted as a plebiscite to choose the National Song, held as an optional additional question in the 1977 referendum on various issues. "Advance Australia Fair" received 43.29% of the vote, defeating the three alternatives, "Waltzing Matilda" (28.28%), "Song of Australia" (9.65%) and the existing national anthem, "God Save the Queen" (18.78%). "Advance Australia Fair", with modified lyrics from the original (see development of lyrics), was adopted as the Australian national anthem on 19 April 1984 by a proclamation by the Governor-General, Sir Ninian Stephen, on a recommendation by the Labor government of Bob Hawke. "God Save the Queen", now known as the royal anthem, continues to be played alongside the Australian national anthem at public engagements in Australia that are attended by the Queen or members of the Royal Family. Since the original lyrics were written in 1879, there have been several changes, in some cases with the intent of increasing the anthem's inclusiveness and gender neutrality. Some of these were minor while others have significantly changed the song. The original song was four verses long. 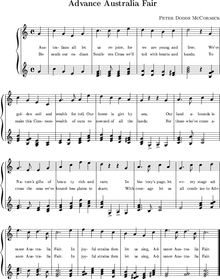 For its adoption as the national anthem, the song was cut from four verses to two. The first verse was kept largely as the 1879 original, except for the change in the first line from "Australia's sons let us rejoice" to "Australians all let us rejoice". The second, third and fourth verses of the original were dropped, in favour of a modified version of the new third verse which was sung at Federation in 1901. Til he landed on our shore. "With all her faults we love her still"
Even though any copyright of Peter Dodds McCormick's original lyrics has expired, as he died in 1916, the Commonwealth of Australia claims copyright on the official lyrics and particular arrangements of music. Non-commercial use of the anthem is permitted without case-by-case permission, but the Commonwealth government requires permission for commercial use. The version of "Advance Australia Fair" that is now regularly played for Australian victories at international sporting medal ceremonies, and at the openings of major domestic sporting, cultural and community events, is by Tommy Tycho, an immigrant from Hungary. It was commissioned by ABC Records in 1984 and then televised by Channel 10 in 1986 in their Australia Day broadcast, featuring Julie Anthony as the soloist. The song has been criticised as Australia's national anthem for failing to represent Australia's indigenous population. Specifically it has been accused of racist lyrics that celebrate British colonisation. Christopher Kelen has argued that the use of "fairness" repeated in every rendition of the chorus is specifically about the civilising process of the white man. Kelen suggests that use of the word "fair" – which he takes to mean "beautiful', "just" or "white" – rejoices the advancement of Australia according to the terra nullius myth, which fails to acknowledge a time before the Europeans colonised Australia including murdering much of its indigenous population. The second line "for we are young and free" has been criticised as being offensive to indigenous Australians. Australian Aboriginal soprano Deborah Cheetham refused to sing "Advance Australia Fair" at the 2015 AFL grand finals citing this lyric, and advocating that the lyrics be rewritten. The fourth line "our home is girt by sea" has been criticised for using the so-called archaic word "girt" to acknowledge the fact that Australia is an island. The current version of the anthem has a mix of "old" and "new" language, rather than having one style of language consistently throughout. Additionally, the lyrics and melody of the Australian national anthem have been criticised in some quarters as being dull and unendearing to the Australian people by a National Party senator Sandy Macdonald who in 2001 that "Advance Australia Fair" is so boring that the nation risks singing itself to sleep, with boring music and words impossible to understand. Political sentiment is divided. Craig Emerson of the Australian Labor Party has critiqued the anthem, former MP Peter Slipper has said that Australia should consider another anthem, in 2011 former Victorian Premier Jeff Kennett suggested "I Am Australian", while former Australian Labor Party leader Kim Beazley defended it. ^ Fletcher, Jim (1986). "McCormick, Peter Dodds (1834–1916)". Australian Dictionary of Biography. 10. Canberra: Australian National University. Retrieved 17 April 2018. ^ "Song and Two Anthems". Sydney Morning Herald. 30 November 1943. Retrieved 1 August 2016. ^ "Australian National Anthem – History". Australian Government. 10 July 2007. Archived from the original on 9 November 2007. Retrieved 1 November 2007. ^ "Plebiscite results: National Song Poll". Parliament of Australia. 30 June 2002. Archived from the original on 5 February 2008. Retrieved 13 February 2008. ^ a b "The Australian National Anthem". Department of Foreign Affairs and Trade. Archived from the original on 23 October 2007. Retrieved 1 November 2007. ^ "Digital Collections – Advance Australia Fair (1901–1919)". National Library of Australia. Retrieved 3 May 2008. ^ "Digital Collections – Advance Australia Fair (1879)". National Library of Australia. Retrieved 1 November 2007. ^ "Australian National Anthem – Commercial use". Australian Government. 10 July 2007. Archived from the original on 9 November 2007. Retrieved 1 November 2007. ^ Kelen, Christopher (July 2002). "How fair is fair? The colour of justice in Australia's official anthem". M/C: A Journal of Media and Culture. 5 (4). ^ "New version of national anthem cuts 'offensive' lyrics". The West Australian. 22 May 2017. Retrieved 13 August 2017. ^ Cheetham, Deborah. "Young and free? Why I declined to sing the national anthem at the 2015 AFL Grand Final". The Conversation. ^ Campbell, David (22 April 2008). "Time girt went down the gurgler". Herald Sun. Retrieved 19 April 2011. ^ Barbie Dutter (27 June 2001). "Call to scrap Australia's 'dull' anthem". The Daily Telegraph (Sydney). Retrieved 20 December 2007. ^ "Senator reignites debate over national anthem". ABC News. 21 June 2001. Archived from the original on 19 July 2001. Retrieved 20 December 2007. ^ Grant McArthur (11 February 2011). "Jeff Kennett wants national anthem change". The Advertiser. Retrieved 9 August 2014. ^ "Kim Beazley – Doorstop Interview (transcript)". Australian Labor Party. 21 June 2001. Archived from the original on 18 July 2001. Retrieved 20 December 2007. ^ "Schools under fire for 'Christian' national anthem". ABC News. 23 September 2011. Retrieved 17 July 2017. ^ "Christian schools re-write Australian national anthem". The Daily Telegraph. Sydney. 2 October 2011. Retrieved 17 July 2017.